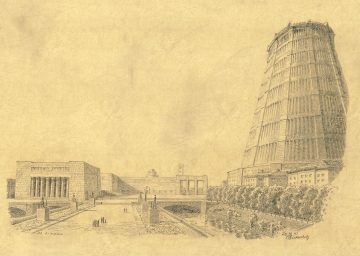 The Architekturmuseum of the Technical University of Munich houses a precious collection of models, plans and sketches by the architect Peter Birkenholz (1876-1961). As a lecturer at the trade school at Basel and as a professor at the Technical University Munich he was dedicated to teaching. Simultaneously, he took part in various competitions and exhibitions. He also established himself as an architect of residential- and commercial buildings, for which he designed the interior decoration. Of all his projects the so called globe-houses were particularly relevant for the history of architecture. He planned them in variable appearances (from garden house to a whole city). It remains largely unknown that Birkenholz's designs covered a huge spectrum from bridges to palace of nations. He also worked as a city planner. The seminar will focus on the designs and built projects of this architect, which are kept in the archive of the Architekturmuseum.